Through ARCCO, Mr. Ruiz mentors small minority subcontractors on various projects, lending valuable technical and administrative support. As a result of these efforts, ARCCO has been awarded “Best Performing Contractor” by the San Francisco Human Rights Commission for its work in employing minority workers, utilizing minority subcontractors and assisting other minority companies in the construction industry. Making a difference is a large part of our business. We are fortunate to be able to contribute time, resources, labor, and materials to improve the lives of people in our city. One of the more interesting awards was given in 2008 by Gavin Newson, mayor of San Francisco at the time, who officially named a day “Antonio Ruiz Day” as a thank you for his part in building the Double Rock Garden in Bayview Hunters Point. 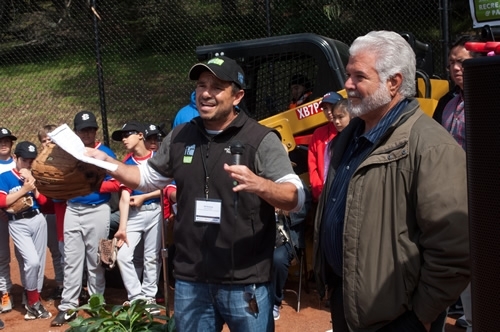 More recently in 2014, A. Ruiz Construction was issued a Certificate of Honor by the SF Board of Supervisors, as a thank you for the donation of the Herz Playground transformation/ renovation and 450 foot ADA walkway to make the playground accessible to all. Our work extends beyond San Francisco to places like Mexico City- where we were able to donate new computers to underprivileged children in grammar and middle schools. ARCCO as a company stands for hard work done to the highest standards, because this philosophy is what has in turn allowed us to be in a position where we can then help others.